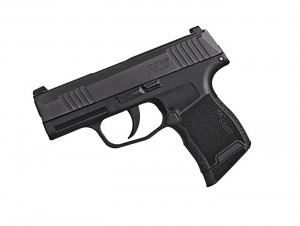 Sig Sauer P365 chambered in 9mm and rated for +P ammunition is a micro-compact pistol. Features night sights and comes with two 10RD magazines, one with a flat base plate and one with an extended base plate. A 12RD magazine is sold seperately. Excellent concealed carry pistol. More compact than the Glock 43, higher capacity and less recoil. Top Gun Supply was very professional and easy to work with. It saddens me as a huge Glock user/owner (42,43,19,17 etc) that Sig has out-glocked the compact carry market thus far. The P365 is amazingly comfortable and the perfect size and firepower. The deal breaker for me was the ability to care 13, yes 13 rounds in this small, accurate, concealable, ergonomic, formidable weapon of choice. This P365 is a winner! Outstanding experience dealing with the professionals at TGS. I purchased this thru the IOP and it couldn’t have been easier. Order was exactly as I ordered it, it arrived quickly, and everyone was extremely honest and helpful.